Geocaching is a high tech game. As soon as you get outside of urban areas most of the time it gets near impossible to find the cache if you do not own a GPS. But GPS alone does not help that much – in order to be as effective as possible the GPS has to be able to display geocaches directly on the map. There are many devices you can buy that supports geocaching but nowadays most people have a GPS on their phones and in this case it really does not make much sense to buy another device. There are many different software solutions for different phones. For example, the iPhone has an application, Trimble has a product that you can install on different phones. But most of the good applications are not free and for some of them you even have to pay monthly subscription (and pay premium membership for geocaching.com). I myself own a phone (HTC S740) with Windows Smartphone 6.1 operating system. The big problem for me is that the Smartphone (or Standard) version is for phones without touch screen (such as mine). There are multiple free applications for Windows mobile phones with touch screen (Professional version) but I could not find one that works for me. Another very limiting factor is roaming GPRS (mobile data) charges. While I am visiting Canada, the charges are approx. 10 USD/Mb. This way geocaching becomes quite expensive if you use an application with an online map (like Google Maps). So for me the application has to be able to download the maps before I go outside and work offline. Suffice to say I did not find anything that would do what I need and I decided that it has to be corrected and I need to write the application myself. A desktop (Windows) application to download maps (you need to copy them to the storage card manually). 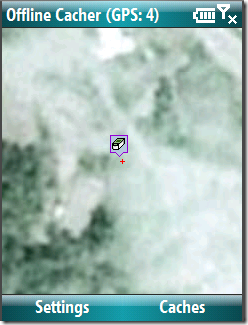 The maps are downloaded automatically for geocaches you select on the map or from a list. Geocaches are loaded from GPX files (you need to be a Premium Member to have access to them). The application downloads and works with maps from OpenStreetMap and Google Maps (both street view and satelite view). 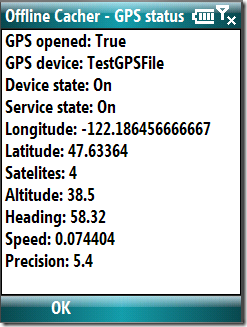 Works with any GPS module that the Windows Mobile operating system can manage automatically (built in or external). Displays the current location on the map. Shows all loaded caches on map by their type, highlights caches that are found, are inactive or that have travelbugs in them. 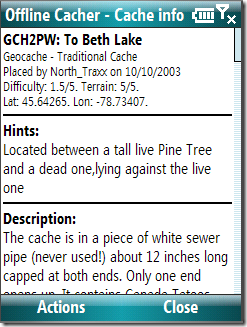 Displays the information about the cache – hints, description, logs. Downloads the cache web page on the desktop application and displays it on the mobile phone – useful if the GPX file did not contain enough logs. Downloads images for the cache and displays them on the mobile phone. Absolutely nothing is downloaded on the mobile phone directly – no need to worry about GPRS costs. Phone that supports Microsoft .NET Compact Framework 3.5. Non-touch screen as this is the target for the application. Enough place on the phone or storage card to store the offline maps (for a few day caching session it could take up to 1Gb of space). I will post the application here soon – if you feel that this is something you need, by expressing that you will probably get me to do that sooner.